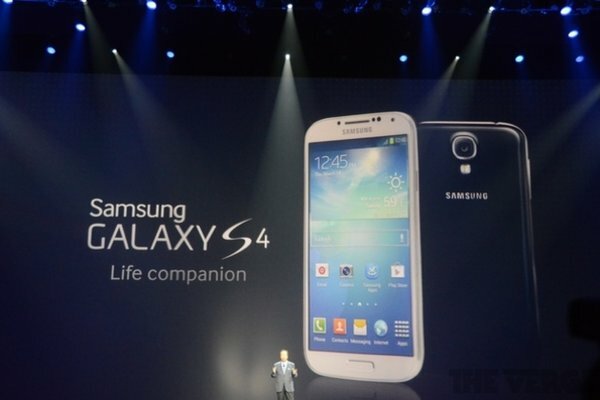 With the launch of the Samsung Galaxy S4, the first major smartphone announcement of 2013 is now behind us. Samsung's strategy with the Galaxy S4 is reportedly aimed as a direct assault against Apple. Their starkly different smartphone product cycles point to different approaches to managing a business that could soon be commoditized. However, as history has taught us, commoditization could threaten the prospects of both companies. While Apple primarily follows an annual release cycle with the iPhone, the company has been known to stick to bi-annual cycle for major upgrades (an iPhone 5S is expected this year). Meanwhile Samsung has moved to a semi-annual flagship release (with the Galaxy S Series and Galaxy Note Series). While we don't have direct information about product development cycles, the shrinking release cycles point to shrinking development cycles for Samsung (and the Android ecosystem in general). These shrinking cycles are an outcome of the integrated vs. modular design principles followed Apple and Android vendors respectively. Apple develops both hardware and software internally, which allows its product design philosophy to be more "coherent". This led to initial performance which was far above what competitors could offer, but the downside is that the product development cycle tends to be long. On the other hand, Android vendors had the advantage of Google taking care of the bulk of software development efforts. This allowed vendors, particularly Samsung, to focus on hardware development (and a few software gimmicks to assist in differentiation). This modular design philosophy limited initial performance and introduced "fragmentation", but sped up the product development process. 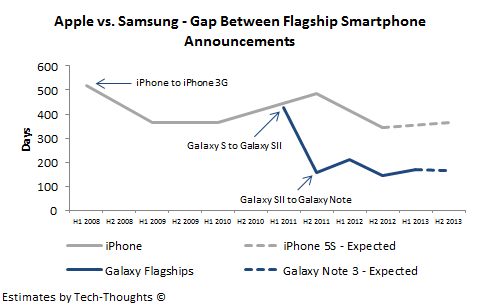 Over the last few years, the rapid product development cycles and hardware focus helped make Samsung products more competitive compared to the iPhone in the high-end smartphone market (particularly in developed markets), while flawed marketing strategies limited other vendors (like HTC). Samsung's rapid improvements seem to have caught Apple's attention - this may even force Apple to skip the iPhone 5S and speed up the launch of an iPhone 6 "phablet". However, the very modular design philosophy that helped Samsung challenge Apple could now threaten its prospects, particularly in emerging markets. Local Chinese and Indian vendors like Huawei, ZTE, Micromax and Karbonn have been rapidly pushing out higher end smartphone devices that are comparable with Samsung's product portfolio and at far lower price points. This is very similar to what we saw during the maturation of the PC industry in the 90s (in a much more accelerated time frame). As competing vendors flooded the market with cheaper, but capable devices, commoditization threatened erstwhile leaders. Given that modular product design is already prevalent, commoditization is a foregone conclusion in the smartphone industry. As price-based competition increases, profits move from OEMs to other segments of the value chain (primarily key component suppliers). Therefore, once commoditization sets in, the only solutions are to diversify into other industries, become a supplier to the commoditized industry (Intel & Microsoft in the PC industry, during the 90s), or to disrupt a new industry. Luckily, Samsung is already a diversified enterprise and component supplier, but disruption is the only option available to Apple.